H: We drove up mid Friday afternoon--an ominous start--through pockets of heavy rain and lightning storms in the distance. We knew fishing was probably a wash but we had already postponed our trip to the West Branch once before. The West Branch Angler Resort was charming with prime river frontage and our cabin was very comfortable (if you don't mind trout bedspreads, trout towel racks, trout toilet paper holders...) After a well-cooked steak at the River Run restaurant, we turned in, praying to the rain goddess to show us mercy tomorrow. Saturday, May 21, 2011: The weather cleared but the damage was done. Water levels on the West Branch were over 5,000 cfs. The boys in the shop pointed us to the Gamelands area near the resort as a possible area to wade. We found a spot, put on our brightest streamers, and stripped them in close to the bank. The water was like dark chocolate milk. It would be a miracle if the fish even saw our lures, let alone exert the energy needed to chase them in these fast waters. We tried a few other spots with no success. But come hell or high water (in this case, very high water), we were determined not to quit. We got in touch with our friend Craig who suggested we try the East Branch which was flowing lower at 2,500 cfs. After checking out several spots we finally found an area where we could wade safely. The sun was shining and the air was thick with bugs, everywhere: caddis, sulphers, bwos, and a few majestic march brown spinners twirling like mini helicopters over the river. The water clarity was better. We watched and waited but no rises. We figured the fish were probably on the opposite shady bank. But how to reach them? We waded out to the very edge of the grassy bottom and noticed an underwater trail running parallel to the river. It was the normal trail that runs by the shore along the bank, but it was now submerged in thigh-deep water. With my poor sense of distance, I reckoned it was about 60 feet to the other side. A challenging cast, but not impossible. Boats were drifting down, fishing the far bank. Several of them recognized us as the 2 (crazy) flygirls determined to wade fish. One boat stopped and anchored in front of us. We spoke with the guide who told us there were some fish on the opposite bank. I naively said we were going to try and cast to them from our current position. He looked at me in amazement and said he would bet me a thousand dollars if I could make that cast. He said it was well over a 100 feet across. He preceded to get his rod and start casting. Within minutes, he had all his line out to the backing and it fell well short of the far bank. He wished us luck and headed down the river. After a few hours on the East Branch we headed back to the West Branch Angler. Discouraged but not defeated. Our last resort--the pond. We needed to feel the weight of a fish on our line whether it was on the river, on a pond, or in a freakin bathtub. We arrived to see fish rising, even jumping out of the water. We fished 30 minutes catching our fill and headed back. Great Blog, Hyun and Jose! Sounds like it was a good trip although fishing could have been better. I enjoyed staying at the West Branch Angler but also had a tough time catching fish last time I was there. 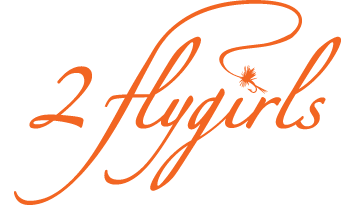 Looking forward to more great fishing stories from you 2flygirls!!! !